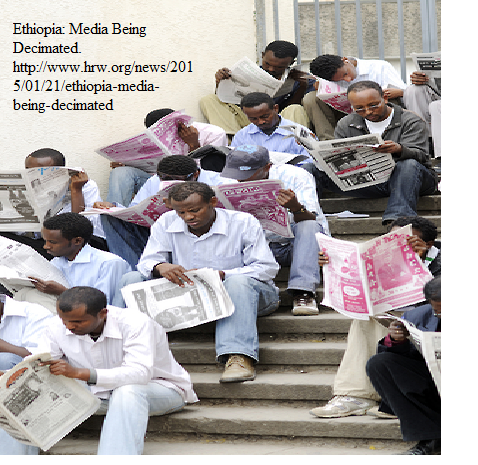 Posted by OromianEconomist in African Internet Censorship, Ethiopia & World Press Index 2014. 25 March 2015 (Privacy International) — German surveillance technology company Trovicor played a central role in expanding the Ethiopian government’s communications surveillancecapacities, according to a joint investigation by Privacy International and netzpolitik.org. The company, formerly part of Nokia Siemens Networks (NSN), provided equipment to Ethiopia’s National Intelligence and Security Service (NISS) in 2011 and offered to massively expand the government’s ability to intercept and store internet protocol (IP) traffic across the national telecommunications backbone. Trovicor’s proposal was to double the government’s internet surveillance capacity: two years’ worth of data intercepted from Ethiopian networks would be stored. Trovicor’s predecessor in intelligence solutions, Siemens Pte worked closely with its British partner Gamma Group International via an offshore company in Lebanon to expand lawful interception in the east African country. Gamma Group’s highly intrusive FinFisher malware suite was used to target Ethiopian dissidents. Forensic traces of FinFisher malware have also been traced back to one of Gamma’s Lebanese operations. Together, the companies and their Lebanese offshore subsidiaries helped one of Africa’s most repressive governments spy on one of its largest populations. The Information Network Security Agency (INSA), created in 2011, consolidated and extended the state’s surveillance and censorship of internet traffic. It is reported to have used ‘deep packet inspection’ which allows for the inspection and rerouting of internet traffic as it passes an inspection point and fulfils certain criteria defined by the inspecting agent. In 2012, it blocked access to the anonymous browsing service Tor, further restricting safe spaces for communication. INSA is alleged to be the agency responsible for using offensive malware from Italy-based Hacking Team in 2013 and 2014 to target journalists. Ethio Telecom runs the country’s phone and internet services as a state-owned monopoly. In 2010, the Ethiopian government contracted France Telecom to manage the company, changed its former name and embarked on a serious expansion of the country’s infrastructure. While good news for rural Ethiopians who have much less access to quality communications services, the government also expanded its surveillance capacities to match. In January 2010, two representatives of the company presented an Ethiopian customer with a detailed operational plan to massively expand the government’s capacity to monitor IP traffic, according to a document obtained by netzpolitik.org. Ethiopia’s fiber optic backbone carries the country’s mobile and internet traffic. Signals travel across Ethiopia through many different traffic routers including local and regional routers and international gateways. IP traffic originating or travelling abroad, for example to and from Gmail’s US-based storage servers, would pass through internet gateways at three sites. In 2010, the existing fiber optic cable routes radiated from Addis Abeba along the country’s roadways to key towns including Gonder and the Sudan border to the northwest, Mek’ele to the North, Nekemte to the West, Awassa to the south, Dire Dawa to the East and out to the Red Sea via Djibouti. That year, the government planned to add 37 new fiber routes covering a distance of around 10,000 kilometers and reaching further into rural Ethiopia. The government required massively expanded powers to intercept IP traffic across the new and existing cables. The government was to add new local-level ‘edge routers’ (ER) to 25 new locations. At each of these ER, Trovicor proposed, the company would install its own next generation network (NGN) taps. These taps would not interfere with the transmission of the signal. Instead, they would also transmit traffic from the ER to a Trovicor aggregation switch that would transmit the signal to the government’s monitoring centre – provided by Trovicor. The monitoring centre would require data from all 25 new aggregation switches to be provided to it on a single 10GbE link. The government would double its storage and archiving capacity under Trovicor’s plan. Two years’ worth of data transmitted across Ethiopian networks could now be analysed. A total of 3 terabytes could be stored online and actively queried by monitoring centre analysts; a further 28 terabytes of material could be archived. With Trovicor’s plan, analysts would be able to locate a mobile caller based on his or her proximity to cell phone towers. Trovicor offered to add this geolocation capacity – a “very cheap solution in comparison to the positioning systems” – to the monitoring centre and to integrate the centre with the network architecture provided by Chinese company ZTE. The 7th floor of Broadway Building in Beirut’s fashionable Hamra district houses two surveillance technology companies – Elaman and Gamma Group, or rather, their offshore affiliates. Both companies provide powerful surveillance technology via Lebanon. 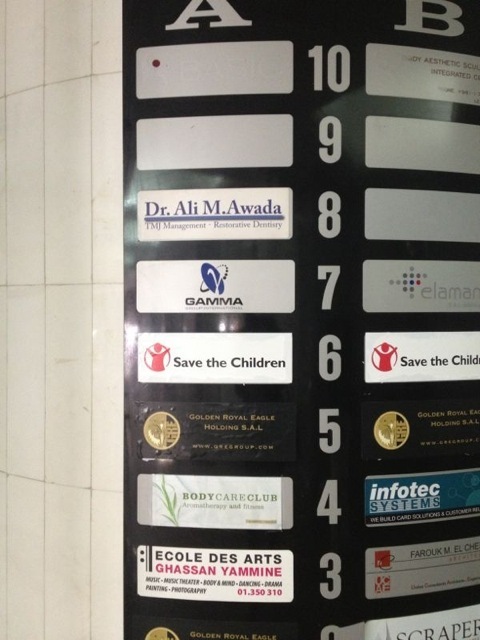 Four joint stock companies – Elaman – German Security Solutions SAL, Gamma Group International SAL, Gamma Cyan SAL Offshore, and Cyan Engineering Services SAL – share the same registered address, above the Beirut offices of humanitarian charity Save the Children. Siemens paid one of these companies, Gamma Group International SAL, for an “Ethiopia Lawful Interception” project sometime before July 2011. Gamma Group International SAL’s business is facilitated by Nabil Imad who appears as a beneficiary on a bank account attributed to Gamma, according to information obtained by Privacy International. Lebanese law requires joint stock companies, known by the French acronym SAL, to have between three and 12 shareholders, the majority of whom must be Lebanese. Nabil ‘Sami’ Imad is listed as the director of both Gamma Cyan SAL and Elaman SAL while ‘Sami Nabil Imad’ appears as director of Gamma Group International SAL. Mohammad Farid Mattar, a lawyer representing the heir of assassinated former Lebanese prime minister Rafik Hariri at the Special Tribunal for Lebanon, is also listed as a director of Gamma Group International SAL. The Lebanese company’s only listed non-Lebanese shareholder is its chairman, John Alexander Nelson Louthean. Louthean directs Gamma Group International Ltd. Gamma Group and Mattar both declined to offer comment. In a written response to Privacy International’s and Netzpolitik’s questions regarding the operation, a lawyer for Gamma would neither confirm nor deny the details of this report. The same lawyer, speaking on Mr. Mattar’s behalf, would neither confirm nor deny Mr. Mattar’s involvement. The “Ethiopia Lawful Interception” project could have been to integrate FinFisher into an Ethiopian Trovicor monitoring centre. Trovicor has offered to supply Gamma products to governments worldwide, including inTajikistan in 2009. A 2010 Gamma Group newsletter celebrated a new partnership with Trovicor based on successful collaboration in joint ventures. Wikileaks has identified that Gamma employees Stephan Oelkers and Johnny Debs visited Ethiopia in 2013 and Elaman CEO Holger Rumscheidt visited in 2012. The combination of the two companies’ capabilities at the time – massive monitoring centres and the deployment of the FinFisher malware – presents a very concerning capability in the hands of a repressive government. FinFisher was used to target members of the Ethiopian political movement, Ginbot 7. Researchers at the Citizen Lab, a technology laboratory based in Canada, analyzed malware samples and determined that a FinFisher campaign originating in Ethiopia used pictures of Ginbot 7 members as bait to infect users – the corrupted files, when opened, would install the spyware onto the user’s device. FinFisher was deployed against Ethiopians living abroad as well. Tadesse Kersmo is a London-based lecturer and member of Ginbot 7. Suspecting that his device was compromised, in 2013, he submitted his computer to Privacy International which, in collaboration with a research fellow of the Citizen Lab, analysed the device and found traces of FinFisher malware. The Citizen Lab’s forensic analysis of FinFisher samples obtained elsewhere have linked certificates for the samples to Cyan Engineering Services SAL. Kersmo used to use his computer to keep in touch with his friends and family and continued to advocate for democracy back in Ethiopia. With his chats and Skype calls logged, his contacts accessed, and his video and microphone remotely switched on, it was not only Kersmo that was threatened, but also every member of the movement. The European Union is currently considering if and how to regulate exports of surveillance technologies that lead to abuses of human rights. For more information, visit Privacy International or the Coalition Against Unlawful Surveillance Exports. 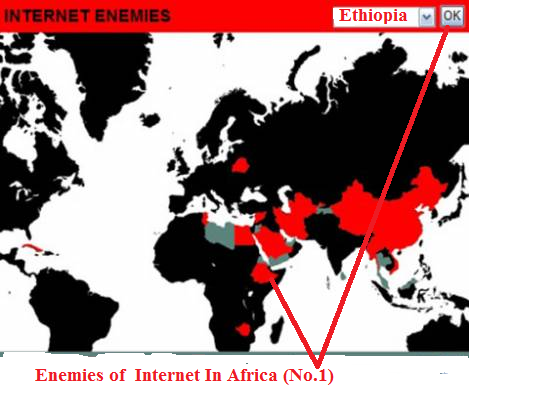 Posted by OromianEconomist in African Internet Censorship, Amnesty International's Report: Because I Am Oromo, Because I am Oromo, Censorship, Ethiopia & World Press Index 2014, Ethiopia's Colonizing Structure and the Development Problems of People of Oromia, Afar, Ogaden, Sidama, Southern Ethiopia and the Omo Valley, Ethnic Cleansing, Human Rights Watch on Human Rights Violations Against Oromo People by TPLF Ethiopia, The Tyranny of TPLF Ethiopia. Posted by OromianEconomist in Ethiopia & World Press Index 2014, Facebook and Africa, The Ethiopian government’s systematic repression of independent media. Ethiopian Intelligence Network: Who is behind the growth? 14 February 2015 ( New Delhi Times Bureau) Ethiopia is a low income country with a population of just under 92 million people. The country has since 1991 been under one party rule of the Ethiopian People’s Revolutionary Democratic Front (EPRDF). Dissidents who use the internet to criticise the one party rule have been accused of promoting terrorism and have been subjected to strict surveillance. According to Human Rights Watch, the increasing technological ability of Ethiopians to communicate, express their views, and organise, is viewed less as a social benefit and more as a political threat for the ruling party, which depends upon invasive monitoring and surveillance to maintain control of its population. Ethiopia regularly blocks websites, undertakes surveillance of websites and social media, and charges journalists over content published offline and online. The country’s laws provide for legal sanctions against individuals for content they publish online, or the ‘illegal use’ of telecoms services. Such charges have often been framed as ‘promoting terrorism’, which can attract a 20 year jail term. Thus, the country has been creating a speedily expanding, state-of-the-art surveillance state, with tacit Western back up. Rumors of the extent of Ethiopia’s digital surveillance and censorship state have echoed around the information security community for years. Journalists have spoken of being shown text messages, printouts of emails, and recordings of their own telephone conversations by the Ethiopian security services. From within the country, commentators connected growing telecommunications surveillance to the increasing presence of East telecommunications company ZTE. On the external front, analysis of the targeted surveillance of exiled Ethiopians has turned up surveillance software built and sold by Western companies, such as FinFisher and Hacking Team. Observers of the country’s national Internet censorship have reported keyword filtering of websites and blocking of Tor nodes that reveal a sophisticated national firewall conducting deep packet inspection. Ethiopia’s position as an American ally also gives it the opportunity to purchase technology made in the West to carry out its campaigns of censorship and surveillance. Ethiopia has also bolstered its surveillance capabilities with drones built by Israeli company Bluebird Systems. However, it is widely believed that Ethiopians have not developed the surveillance network using the available resources in the country. Indeed it is even futile to think that a third world country like it, which does not have enough resources to feed its poverty stricken population will invest heavily in surveillance technology. 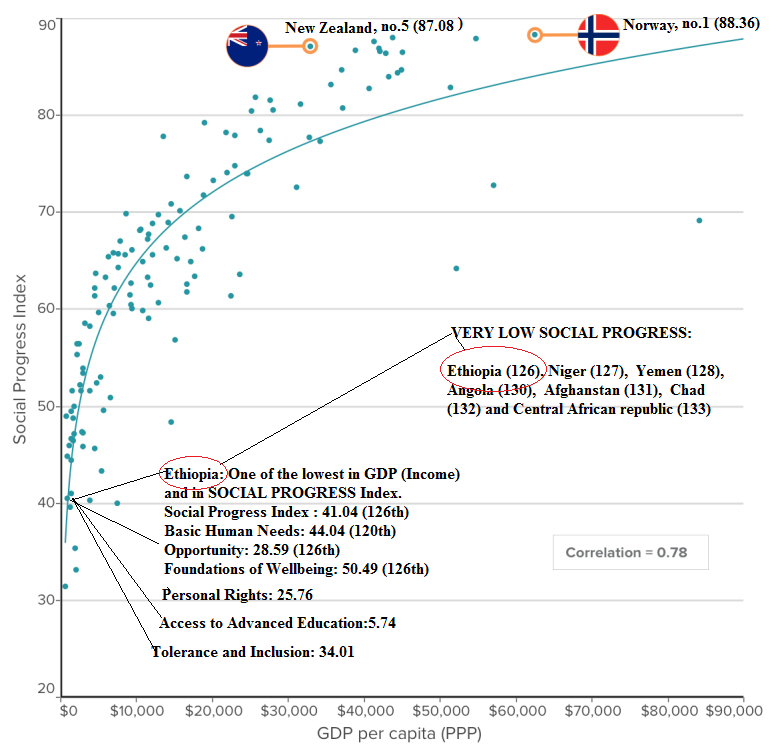 There are many who believe that West is funding such programs. However, on a more detailed look, it looks as if East technology is behind the program. Screenshots of extra fields on ZTE’s ZSmart customer relations management tool appear to show that Ethiopia’s telco administrators can check customers against a “blacklist,” and digitally record calls with the press of a single button. These features could simply be a result of Ethiopia’s censorship team quickly adopting new techniques — or it could mean that Ethiopia is one of the few countries that benefits from the direct export of Great Firewall technology. In the case of Ethiopia, there have been reports that East is training the surveillance team for as period of six months and then using it for own proxy intelligence. Whether or not the activities of such companies represent cybersecurity concerns – these rapid changes in Africa’s media and telecommunications sphere are an overlooked and illustrative example of the impacts and influences of a rising East, which warrant greater study and attention from policymakers and civil society in Africa and elsewhere, in particular those who are keen to ensure both increased cooperation and connectivity and free and secure communications among citizens. Posted by OromianEconomist in Africa, African Internet Censorship, Amnesty International's Report: Because I Am Oromo, Ethiopia & World Press Index 2014, Facebook and Africa, Tweets and Africa. Denmark ranked Number One in ITU’s ICT Development Index (IDI)*, a composite measurement that ranks 166 countries according to their level of ICT access, use and skills. It is followed by the Republic of Korea. The IDI top 30-ranking include countries from Europe and high-income nations from other regions including Australia, Bahrain, Canada, Japan, Macao (China), New Zealand, Singapore and the United States. In terms of regional comparisons, Europe’s average IDI value of 7.14 remains well ahead of the next best-performing region, the Commonwealth of Independent States (CIS – 5.33), followed by the Americas (4.86), Asia & the Pacific (4.57), the Arab States (4.55), and Africa at 2.31. The CIS and the Arab States showed the highest improvement in regional IDI averages over the past 12 months. Posted by OromianEconomist in Africa, Corruption, Ethiopia & World Press Index 2014, Ethiopia's Colonizing Structure and the Development Problems of People of Oromia, The 2014 Ibrahim Index of African Governance, Uncategorized. Ethiopia has been ranked 47th out of 52 countries in Africa by the Mo Ibrahim 2014 governance index on Human Rights. Ethiopia’s score in this category is 28.8/100. Ethiopia (28.8), CAR (27.9), Gambia (26.2), Equatorial Guinea (10.5), Eritrea (8.6) and Somalia (7.3) are the worst performing in this category. Ethiopia has been one of the most deteriorating trend for the last five years with score for change of -6.3. Top 5 performing countries in this category are: Cabo Verde (84.4), Mauritius (81.7), Ghana (78.1), Senegal (74.7), Namibia (73.3). 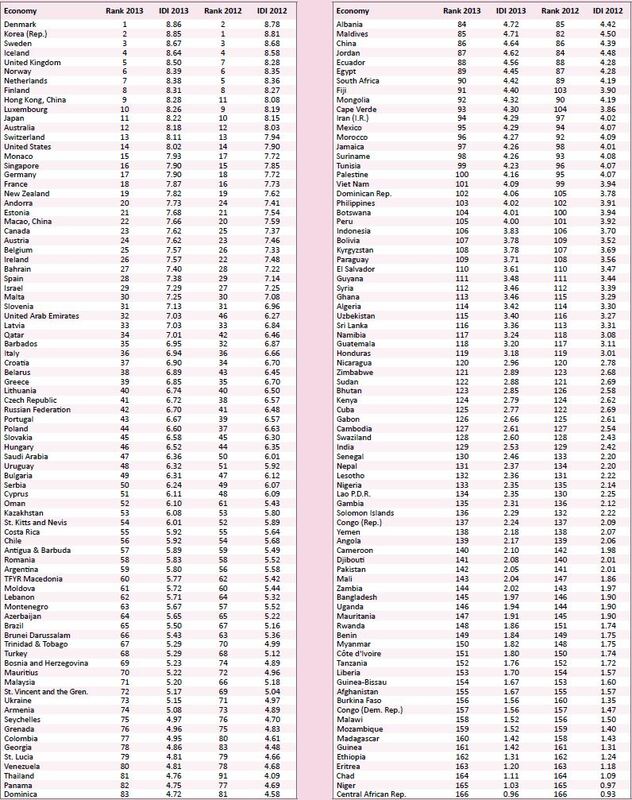 Average African score for human rights category has been 49.4. The 2014 Ibrahim Index of African Governance, launched on 29 September 2014. Ethiopia ranks 32nd in over all Ibrahim Index of 2014 African Governance with score of 48.5/100. The top 5 scorers are Mauritius (81.7), Cabo Verde (76.6), Botswana (76.2), South Africa (73.3) and Seychelles (73.2). The foundation conducts its assessments with four main conceptual categories: Safety & rule of law, participation and human rights, sustainable economic opportunity and human development. Posted by OromianEconomist in Africa, Amane Badhaso, Ambo, Ayantu Tibeso, Colonizing Structure, Development & Change, Dictatorship, Ethiopia & World Press Index 2014, Ethiopia's Colonizing Structure and the Development Problems of People of Oromia, Finfinne is Oromia's land, Finfinnee, Finfinnee is the Capital City of Oromia, Genocidal Master plan of Ethiopia, Human Rights Watch on Human Rights Violations Against Oromo People by TPLF Ethiopia, NO to the Evictions of Oromo Nationals from Finfinnee (Central Oromia), Oromia Support Group Australia, Oromians Protests, Oromiyaa, Oromo, Oromo and the call for justice and freedom, Oromo Culture, Oromo Identity, State of Oromia, The Colonizing Structure & The Development Problems of Oromia, The Tyranny of Ethiopia, UK Aid Should Respect Rights. There is an Ethiopian saying, “one would lose what one has in the hand while reaching for more from the upper shelf.” While this selfish individual tries to get hold of more, what one has already have will be scattered all over the place. Lately, in the Habesha camp, fear has spread, and uneasiness has increased likewise. Soothing, warnings, rebuking, and many others had been tried. Unfortunately, they try to tell us that the source of their problem is the national struggle of the Oromo people. In reality, the aim and goal of the struggle of the Oromo people is to get rid of authoritarian rulers, and thus, to achieve the right to self-determination for the Oromo people – based on international regulations and laws. The importance of the struggle is not only for the Oromo people, but for all peoples of the empire who are suffering under the colonial rule. So, the Oromo people trust in the united struggle of the oppressed peoples. The Oromo national movement will wedge, and has been wedging, joint struggles with forces of similar aims. In other ways, the Oromo people demonstrate peace in their cultural and administrative structures, and support fair unity. Fair unity helps the weak and stands for the oppressed. A good demonstration is the exemplary unity of the different ethnic groups living in today’s Oromiyaa – despite the numerous attempts by anti-Oromo groups to create rifts between the Oromo people and the other ethnic groups. As the Oromo people – in their social lives and national struggle – respect the rules of human rights, by any measure, they are not threats to neighboring and same-region peoples; the information, which has been disseminated by groups wanting to re-instate the old system and TPLF jointly and independently, has turned out to be fake and false time and again. • By the sacrifices paid by its dear children, the Oromo Nation has been able to show to the whole world its country’s boundaries and its true history. By blood and bones of her children, our country Oromiyaa will be respected till eternity. This is the reality. 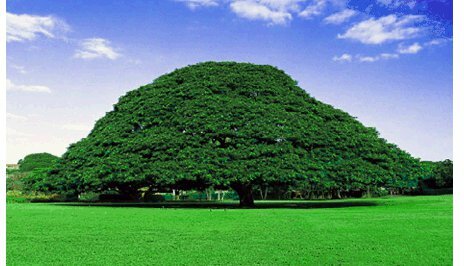 • The language and culture of Oromo people has been developing on solid foundation. Today Afan oromo has its own alphabets. Millions study, teach and do research by it. Medias with International audience broadcast by it. It has become language of literature. As this indicates that the struggle is nearing the end, we must take note. • The Oromo people’s struggle has arrived at the generation which does not fear death, and which is ready to sacrifice for its dignity and for the sovereignty of Oromiyaa. This confirms all. As this reality has already been seen on the ground, there is no need for further explanations. • The international community has not only understood, but forced to look for solutions about the arbitrary killings of the Oromo people. This is the fruit of the relentless struggle. Even if you don’t like it, you know the exact gist. • Today, we have arrived at a historical chapter where the Oromo people have demonstrated that they will not crack by propaganda of anti-Oromo elements, and that they have stood together in unison for a common goal. This cooperation among all segments of the Oromo people has started to shake your power base – giving you high blood pressure as demonstrated by the recent uprising. • As the Oromo national struggle consists of all options, Oromiyaan mountains, valleys and forests are witnessing strong military preparations. Accordingly, in May 2014 the Oromo Liberation Army has attacked enemy soldiers, and more than 200 soldiers have been put out of action. It has also confiscated a number of military equipment. Overall, the Oromo people have scored important victories, and are mobilizing their human and material resources to claim the rest of their rights. So, are you trying to stop this visionary generation by imprisonment? Or trying to fool them through rebuke and fake words? To tell you the truth, that era has passed. Let me help you realize the truth. You can’t stop them. This is because you can’t stop a generation with a cause. The better way is to drop the old eyeglasses, which has twisted the truth, and straighten your views and live together. May God help you. Posted by OromianEconomist in Africa, Colonizing Structure, Ethiopia & World Press Index 2014, Ethiopia's Colonizing Structure and the Development Problems of People of Oromia, Afar, Ogaden, Sidama, Southern Ethiopia and the Omo Valley, Human Rights, Human Rights Watch on Human Rights Violations Against Oromo People by TPLF Ethiopia, Jen & Josh (Ijoollee Amboo), Tyranny. 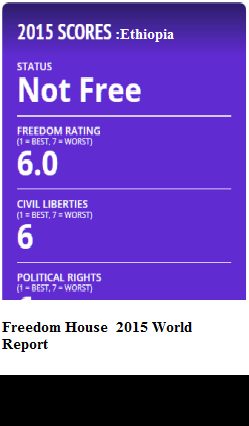 Ethiopia is rated Not Free in Freedom in the World 2014, Freedom of the Press 2014, and Freedom on the Net 2013. The 2014 World Press Freedom Index spotlights the negative impact of conflicts on freedom of information and its protagonists. The ranking of some countries has also been affected by a tendency to interpret national security needs in an overly broad and abusive manner to the detriment of the right to inform and be informed. This trend constitutes a growing threat worldwide and is even endangering freedom of information in countries regarded as democracies. Finland tops the index for the fourth year running, closely followed by Netherlands and Norway, like last year. The 2014 index underscores the negative correlation between freedom of information and conflicts, both open conflicts and undeclared ones. In an unstable environment, the media become strategic goals and targets for groups or individuals whose attempts to control news and information violate the guarantees enshrined in international law, in particular, article 19 of the International Covenant on Civil and Political Rights, the 1949 Geneva Conventions and the 1977 Protocols Additional 1 and 2 to the Geneva Conventions. Tyrannic countries such as Ethiopia, Turkmenistan and North Korea where freedom of information is non-existent continue to be news and information black holes and living hells for the journalists who inhabit them.